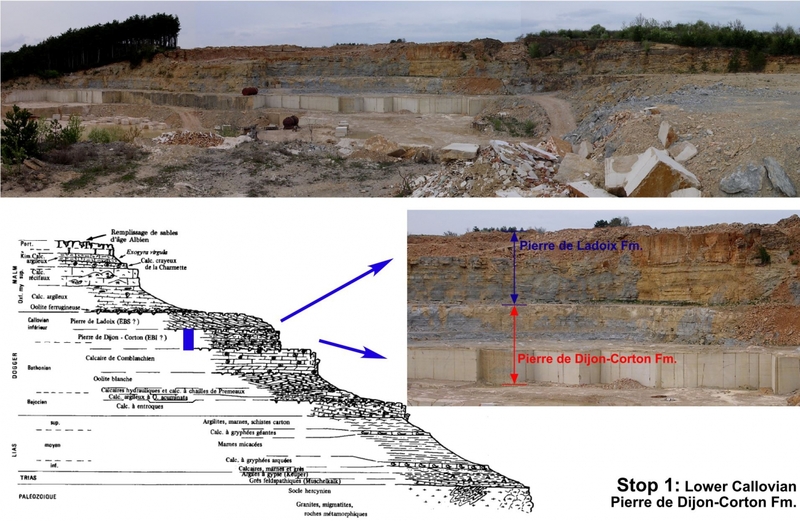 The field trip in Burgundy (eastern margin of the Paris Basin) has been designed to show the contribution of the sequence stratigraphic approach to the understanding of the architecture and potential reservoir distribution of Jurassic carbonate platforms. The outcropping stratigraphic successions are time-equivalent to those drilled in the center of the Paris Basin. Relative changes in sea-level are the major control over the style of sedimentation and over the development of discontinuity surfaces. 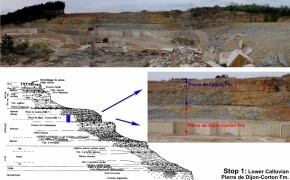 The observed stratigraphic successions commonly include meter-scale subtidal cycles, which respond to combined changes in relative sea-level (accommodation space) and in the carbonate factory. These high-frequency cycles are the building blocks of systems tracts and depositional sequences, which may be tied from the Paris Basin sub-surface domain to the Burgundy outcrop data. The discontinuity surfaces that are bounding depositional sequences and systems tracts have commonly recorded complex diagenetic effects. They play a major role on the preservation, acquisition and/or evolution of the porosity, specially because of very early dissolutions and/or cementations.